… If the Beavers can do it, why not the Ducks? Good question. Perhaps the president of the UO administration, Mike Gottfredson, will commission a responding op-ed from his $207K lawyer Randy Geller, or his $218k strategic communicator Tim Gleason, or his $450 an hour backup lawyer Dave Frohnmayer? I’m on the Senate ad hoc Freedom committee, and can report that the sticking point for President Gottfredson is giving students and staff “the freedom to address, question, or criticize any matter of institutional policy or practice”. That’s right, under Gottfredson’s version of Academic Freedom, the student and staff who signed this op-ed could be subject to institutional discipline for it. Gottfredson should get over his weird obsession with controlling what people say, sign the policy already, and let us all get back to our jobs. Senate to strip Geller of his powers? Prior to any decision to participate in litigation not directly involving the University as a party by filing an amicus curiae brief, the General Counsel shall notify the President of the Senate of the intention to do so. Kudos to Gordon Sayre (English) and Tom Lininger (Law) for getting this done. Maybe Geller will react by firing off another email like this one? Or this unlawyerly stupidity, which made it into the Oregonian? 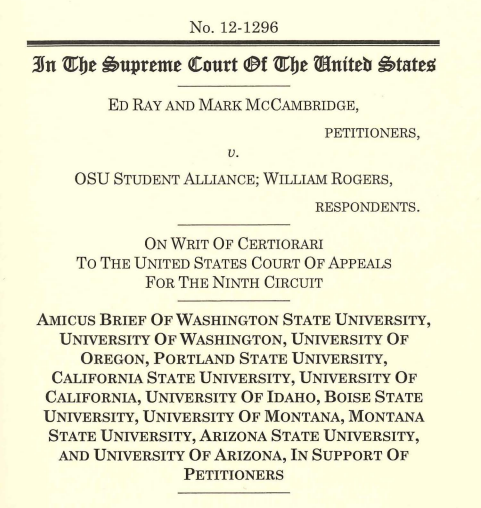 In brief: UO paid our General Counsel to help write an anti-free speech brief to the SCOTUS. From the timing, it looks like President Gottfredson authorized this. Perhaps the most interesting development, given the recent hubbub about Oregon State’s efforts to restrict employee’s access to public records, is the governance part of the draft policy, which discusses UO employee access to information. This policy on Academic Freedom builds on existing commitments to Freedom of Inquiry and Free Speech at this institution and elsewhere by defining additional freedoms that are specific to the proper functioning of our academic institution. Academic Freedom exists in the contexts of scholarship, teaching, governance, and public service. • SCHOLARSHIP. The University’s research mission requires that faculty and students have autonomous freedom to conduct research and produce creative work, and to publish and disseminate that work, limited only by the standards and methods of accountability established by their profession and their individual disciplines. • TEACHING. The University’s responsibility to help students to think critically and independently requires that faculty and students have the right to investigate and discuss matters, including those that are controversial, inside and outside of class, without fear of institutional restraint. Matters brought up in class should be related to the subject of courses or otherwise be educationally relevant, as determined primarily by the faculty member in charge of the class. • GOVERNANCE. The university is governed by the faculty and the president, with authority delegated as appropriate by the faculty to the University Senate. Institutional policies and practices are informed by consultation and advice from the faculty, staff, and students. Therefore, members of the university community have freedom to address, question, or criticize any matter of institutional policy, action, or administration, whether acting as individuals or as members of an agency of institutional governance. In the context of governance, consultation and advice requires timely and meaningful access by staff, students and faculty to information pertinent to institutional policies and actions, whether such requests arise from a university member acting from an agency of institutional governance, or as an individual. • PUBLIC SERVICE. Public service requires that members of the university have freedom to participate in public debate, both within and beyond their areas of expertise, and to address both the university community and the larger community with regard to any matter of social, political, economic, cultural, or other interest. In their exercise of this freedom, university community members have the right to identify their association or title as university faculty, staff, or students, but should not claim to be acting or speaking on behalf of the University unless authorized to do so. The academic freedoms enumerated in this policy shall be exercised without fear of institutional reprisal. Only serious violations of this policy – ones that rise to the level of professional misbehavior or professional incompetence – should lead to adverse consequences. Any such determinations shall be made only in accordance with established, formal procedures involving judgment by peers in the profession and not by administrators. These freedoms are rights protected by the university. This policy shall be incorporated in employment agreements and comparable corresponding contractual agreements with university employees. This policy, when approved by the UO Senate and the President, shall be incorporated into the Faculty Handbook, the UO University Policy Library, and all letters of appointment or other contractual agreements. Update: UO administration time-travels back to 2009, finalizes UO’s draft Academic Plan. Now it’s suddenly been post-dated a day, and it’s final. Sporadic Senate live-blogging. Wednesday 11/13/13 3:00PM, 282 Lillis. Disclaimer: My opinions of what people said, meant, or should have said. Nothing is a quote unless in quotes. Lin raises question on the calculation of 2/3 majority. Simonds replies abstentions don’t count, Paris agrees, refers him to Robert’s Rules. Stahl checked the video, asks for re-insertion of a sentence regarding no-confidence votes and executive session. Paris has already done it. Shout out to faculty committees hard work. Outstanding group of board members. CBA was great achievement. Added many, many more TT faculty (20?) smarter students, new buildings, new capital campaign. SB 270 was great accomplishment, new freedoms for campus and board, we can sell bonds. Great path forward. Outstanding board, couldn’t be better. We need a strategic plan for resources. 2009 Ac Plan is a great plan. He doesn’t seem to be joking. Benchmarking report. We are a great research university but we need more money. Coltrane is tasked with developing a Strategic Plan, is tasked with actually talking to the faculty. Campus forums, etc. Three central goals: Excellence, Access, Money. 1) Need more faculty – 60 TTF right away. We’ve got $ for about 30. Wants more than that. 2) Need more grad students to boost research. Need more money for grad fellowships. Need more buildings. 3) Need big endowment increase. Vague generalities about targeting. 15 months on the job, nothing more specific? We’re in the quiet phase of fundraising now, making key fundraising hires, talking to big donors. We got a little more state money last year, hope to get more. Word about the Shelton’s budget model: Lots of concerns about lack of support for research and grad students, manipulation like Doug Blandy did in AAD. Need to change it. Modest changes, to make better strategic decisions, graduate education. Provost is appointing an advisory group to get input on budget model and strategic spending, without going through the Senate! Academic Freedom – very exciting meeting with Senate group on this last week (I wasn’t in the room with him, but like the motion.) He’s now very pro freedom. Quite a change from what Geller, Blandy and Gleason were doing during the bargaining. On athletic subsidies: Complex matter, must be careful. He’s met a couple times with Senate leadership on the Senate motion, wouldn’t let Harbaugh in the room. Provost Search, expects campus visits in January or so. Searches for Ombud, Library Head, Dean or two. Q: On academic freedom. What were your objections to last years policy, other than divide it in two. A: We had a bump in the road. We’re on the right path now. Followup: Are you supportive of the language as written? Q: You mentioned strategic plan. Seems very top down. What should units do to align with it? Can you share it? A: Yes, 2009 Academic Plan. (That plan’s a joke, was never even completed, Bean dropped the ball.) Also need Strategic Capital Campaign. Long discussion of admin appointing AAG groups outside the Senate. Harbaugh moves to amend to require consultation with the Senate Exec and a vote of the Senate on the membership. Amendment passes, motion passes with full support. Very good precedent. Diversity stuff can get contentious, need faculty buy-in and consultation. Postponed due to desire to get to the legal services and freedom stuff. Removed for now, needs more discussion to discuss principles and rules. Has volunteers, will appoint soon, will have meetings and reports, then motions in April or so. Blonigen reports. Notes this is late. Committee is meeting with lots of people, looking to hear about interactions, areas for improvement in office, general research at UO. Has an outline of a report, still needs input from others, expect report to be ready by Jan.
Goal is to have a committee by next meeting. Sorry, can’t type fast enough, missed some. 11/11/2013 update: The Senate will have remarks by President Gottfredson (I hope including solid progress and numbers on last year’s resolution to reduce athletic subsidies). On Wednesday the Senate will vote on policies to limit Randy Geller’s control over legal services, and to strengthen academic freedom. As explained below, the motion to “rescind academic freedom” actually will allow the Senate to strengthen academic freedom. That the Senate Academic Freedom Work Group will continue to work with the University President to draft a strong academic freedom policy. The motion to rescind is directed to the April 2013 Senate policy proposal – which has not been signed by the President – and is therefore not in force. This simply means that the April 2013 policy, adopted by the Senate but not in force, will be rescinded if the motion passes. This would leave the current 2010 University Policy on Freedom of Inquiry and Free Speech in place as the University Senate workgroup continues to meet with President Gottfredson on this matter. The motion is intended to procedurally “clear the table” so that the workgroup and President Gottfredson can identify mutually agreeable improvements. The Senate workgroup is comprised of Professor Michael Dreiling (Chair), Senate President Margie Paris, Professor John Bonine, Professor Deb Merskin, Professor Bill Harbaugh, and Professor John Davidson. If the Senate concurs, regular reports on the progress of discussions between the Senate workgroup and President Gottfredson will be presented to the University Senate. We hope this information will help as you consider this motion. Please feel free to let me know if you have any questions I may be able to help answer. Oh wait, that’s in China. Whew. The NY Times has the story. I apologize for the skimpy notes below. The Senate spent a fair amount of time on the Academic Freedom policy passed in April, but never signed by President Gottfredson. Neither Gottfredson nor Randy Geller was present to explain precisely what objections the administration had. Senate Pres Paris appointed a committee consisting of John Bonine (Law), John Davidson (Poli Sci), Michael Dreiling (Poli Sci), Bill Harbaugh (Econ) and Deb Merskin (Journ) to find out what their problem is, and what language President Gottfredson will accept. We also discussed procedures for motions of no-confidence. President Paris agreed with others that any such motions would be debated publicly. Low turnout, and the Senate still has a bunch of unfilled seats. Senate Meeting Agenda – October 9, 2013 282 Lillis, 3:00-5:00 p.m.
No quorum yet, so no votes on minutes. President Gottfredson will miss this, he’s schmoozing with the “UO Portland Council” at White-Stag. Anyone know what this council is? Google has never heard of it. Presumably they’ll be talking about whether or not UO should renew the $2.4M lease on the Portland clubhouse. Coltrane delivers speech. Good incoming students. New need-based scholarships have increased number of Pell students. GPA also up. 535 new Pathway Oregon students, vs 400 last year. 80 new faculty (gross, not net). Only 35 are TTF. “More diverse than the faculty look”. OK, they look different. Do the think different? I’ve been busy with board and collective bargaining. New board confirmed soon, need to work on by-laws etc. I wonder who’s in charge of that. New CBA will help NTTF’s, standardizes practices. Implementation of policy will come through Senate and Pres. Lots of work. $300M in new buildings, but we couldn’t afford to follow through with plan to raise faculty salary to comparators. Gottfredson will now turn his attention to internal issues. Strategic plan for capital program. Try to stay in AAU. Hire 4-5 new faculty in strategic areas. Budget model needs work. Years of growth. Graduate student ratios “are a little out of our norm”. Q: What do you mean by attention to the budget model? A: Shelton has a technical task force working on the plumbing. There’s a “Budget Committee” that includes Senate members. Maybe move away from the tax to ?. Pres is concerned about funding research and graduate education. Need private money to secure our place as a research university. Q: When you say graduate education, will that include law school grad program? A: Yes. Need more money for grad fellowships including law. Followup comment: Gott is absent, and missed half of the Senate meetings last year. Did he also miss FAC meetings. Paris: We’ve now got a quorum, minutes are approved. Need a Senator for the IFS. 6 meetings a year. Kyr is nominated, approved unanimously. Lisa, new Senate coordinator is introduced. Paris runs through handy slide. See link. Board of Trustees at the top, followed by statutory faculty, Assembly, Senate. More than 2 unexcused absences and you are off the Senate. Good rule. Decorum: We will obey Robert’s rules, with help of Paul Simonds! Q: Can we get a better room? Not this time. Good idea to correspond with your constituents. Read the agenda, email them with motions in advance. Stahl: Are all the administrative advisory groups that have been set up an abrogation of Senate authority? Paris: Good question. We should look into it. President Gottfredson refused to sign it, and his union bargaining team adamantly opposed putting it in the collective bargaining agreement. Gottfredson got some national ridicule and backed down, a little. Now the Senate is going to decide how to respond. My understanding is that the UO constitution calls for the President to defend himself to the faculty assembly in these situations. Paris: Update on academic freedom. Pres was required to adopt this w/in 60 days or come back to Senate. Gottfredson did this, requesting that the policy be split into two: one on academic freedom, one on freedom of speech. Then the AY ended. Gottfredson will come to the Senate in November and explain. Harbaugh: So he wants it split but didn’t say how? Why don’t we ask him to split it or do it ourselves? Kyr: Motion for a group to get this done quick? Bonine: Pres was obligated to make this request w/in 60 days. Hubin says that the message could be interpreted as a request for a delay, which is allowed. Goes into Garcetti and new Demers 9th circuit opinion. Senate votes to set up another committee to try and deal with this. approved 17 to 8. Group will include Bonine, Harbaugh, Davidson, Dreiling. That would certainly be an improvement. Kyr reads the motion. It spells out the GC’s responsibility to provide high quality legal assistance. 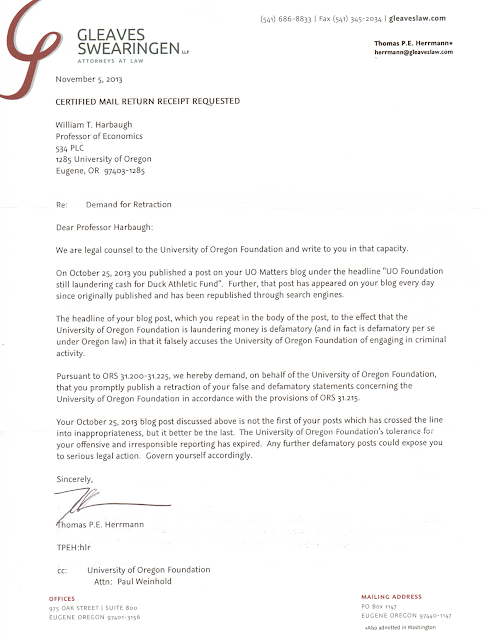 Authorizes Randy to provide legal opinions about UO stuff, and hire high priced legal help from Harrang et al. New language removes Randy’s monopoly on providing legal advice to faculty, students. We have the right to seek legal advice – revolutionary. UO shall defend employees against acts of omission, including those in teaching, research, service. (Merle Weiner clause). Employees may be reimbursed for legal expenses, especially if there’s a conflict of interest. Paris: Originally drafted by Geller’s office, would have given you the red-lined version but it’s all red. Tublitz proposed 2 amendments today, want to add these. Right to legal advice: what if Senate wants alternative, competent legal advice? Amendments allows this. Mitchell, Harbaugh: SB242 took away DOJ’s monopoly on legal service to OUS institutions. Minor problem for some of the wording. Lamar Wise: ASUO supports motion because it gives chance to get out from under Geller. Stahl: Hold back til we get the DOJ thing figured out. Sullivan: Geller represents the administration. If he’s defending an employee, who’s the client? Paris: Let’s go back and research this stuff. Good call. Kyr: We will make Geller show his mug at the next meeting. Meanwhile, direct questions to Paris. Postponed. Paris: We’re kicking this can down the road to the Board of Trustees. So no vote, the motion is tabled. Kyr: This has now become the 12th year review. Passes around signup sheet for volunteers to staff committees to revisit charges of the committees. Kyr will go and report. The administration has become addicted to using these AAG’s to do an end run on shared governance through the Senate. No charge, handpicked faculty members. Hubin’s Public Records AAG is the most nefarious example. Gottfredson’s Budget Advisory Group is another. Alex-Assensoh, VP for Equity, wants to form an AAG and actually wants to do it through the Senate. Respect. What do we have to do to get the rest of our administration to do sensible things like this. Tublitz has been serving as liaison to this, without a formal process. Senate Exec has apppointed him for the rest of the year, then we’ll have a formal process. Stahl: Last year Senate voted to create a committee on proprietary research. What happened? Paris: We’ll have it by next meeting. Stahl wants UO to stop giving academic credit for Military Science (ROTC). I think Napoleon said it best: Si vis bellum para pacem. Besides, you get to rappel out of helicopters – who can say no to that? But we should do something about their grading policy – last I looked it was almost as inflated as Doug Blandy’s notorious online AAD classes. The MIL classes are popular easy A’s for the student-athletes. Stahl: Asks what happened to the motion last May for a vote of no confidence in Gottfredson? Paris: I advised Senate to go into exec session, even though it was just a notice of motion. Maybe I was wrong. Bonine: Exec sessions are not allowed on policy matters under Oregon public meetings law. Harbaugh: So, if this happens again, god forbid, will we have a public discussion? Paris: Yes, I believe so. Simonds agrees. Bonine: Hell yes. Since we don’t have the power to fire the President, a vote of no confidence is *not* a personnel matter, and should not be secret. Stahl follows up on procedures: Can the Senate Exec decide not to bring a motion forward? Adjourned 5 min early! Sweet! This was not some haphazard show of frustration where we all celebrated the fact that we’d caused a disruption. As reported in Diane Deitz’s May 31 article, we went so far as to apologize to Gottfredson for having to interrupt his ceremony during the microphone check. The fact is that it was one of the few times when we were even sure of where the president was going to be. Gottfredson has repeatedly ducked or avoided our groups’ requests for meetings. He has canceled scheduled meetings with campus workers after people had already shown up. To anyone who is familiar with our new president, none of this should come as a surprise. Not only has Gottfredson abandoned the interests of the students in proposing the tuition hike while raising administration salaries, but he has also abandoned the faculty of our beloved university (specifically sharing governance with them, and particularly on academic matters). Jacklin’s LESST group’s website has more. Gottfredson’s public records office, which charged me $108 to see 6 months of his official calendar, is now trying to charge the students $240 for the most recent 5 months. Last I heard they were still trying to scrounge up the money. And the Foundation for Individual Rights in Education is reportedly questioning the efforts of Assistant Dean of Students Chicora Martin to move the demonstrators from Knight Court to some sort of unconstitutional “free speech zone”. Meanwhile Gottfredon’s new chief of staff Greg Rikhoff still won’t say who is on Gottfredson’s “Budget Advisory Group”, much less produce copies of their charge or minutes. It’s been almost 3 weeks Greg. Update: Rikhoff just sent me the list of members, but not the committee’s charge. I’ve got a request in to Moffitt and Shelton, who co-chair it, for that and the minutes. A former University student informed the University that she had not reported being assaulted when she was a student because the person who assaulted her was a football player, football players could get away with whatever they wanted, and everyone would think she was bringing a false report. Several community members, current students, and faculty members similarly indicated that football players are seen as being given undue favoritism and allowed to get away with anything, including sexual assault. For example, some people stated that the University and the community treat football players as if they are “Gods.” From spring 2009 to spring 2012, six football players were accused of aiding, attempting, or committing sexual assault through the University’s complaint procedures. Three of these players were involved in an assault where the University did not initiate SCC proceedings until almost a year after the coach had notice that the victim had filed a report with the Missoula Police Department. The Foundation for Individual Rights in Education has more, here. A federal jury today found former Valdosta State University (VSU) President Ronald M. Zaccari personally liable for $50,000 for violating the due process rights of former student Hayden Barnes in the case of Barnes v. Zaccari. In May 2007, Zaccari expelled Barnes for peacefully protesting Zaccari’s plan to construct two parking garages on campus, calling a collage posted by Barnes on his personal Facebook page a “threatening document” and labeling Barnes a “clear and present danger” to VSU. Update: Idaho athletic director Rob Spear suspends quarterback for tweeting that Idaho athletic director Rob Spear is “stupid”. And petty and insecure as well. 30% Monitoring athlete-agent activity and perform regular surveillance on campus, in the community and in cyberspace for the purposes of NCAA compliance and state law. And of course talking to a reporter without permission can really get a UO athlete into trouble. Tom Hart’s full contract is here – lots of other interesting responsibilities. UO has refused to turn over his resume, but a commenter notes he has years of state police experience, including SWAT team and anti-terrorism training. Anyone got a photo of him? 10/26/2012. Gertz v. Robert Welch, Inc. (1974) held that even private-figure libel plaintiffs (1) may not recover proven compensatory damages unless the defendant was at least negligent in its investigation, and (2) may not recover presumed or punitive damages unless the defendant knew the statement was false or recklessly disregarded a known and substantial risk that the statements were false. The District Court in Obsidian Finance held that the defendant was not entitled to the protection of Gertz, because she was not a member of the “media.” But as I’ve argued in my forthcoming University of Pennsylvania Law Review article, Freedom for the Press as an Industry, or for the Press as a Technology? From the Framing to Today, the First Amendment has historically been understood as protecting people who use mass communications technology equally, whether or not they are members of the institutional media. I much look forward to litigating this case, and, I hope, getting the District Court decision reversed. Thanks to http://twitter.com/#!/MarshallYoum for the link. Canada has limitations of speech. England, Israel, all kinds of democratic countries have different perspectives on unbridled speech. That is something that may become more of an issue as our country evolves. As our country evolves to ….? 8/3/2010: From the Volokh Conspiracy, word on a potentially important circuit court decision imposing strict limits on when universities can charge controversial speakers for security. I don’t know if this will affect what UO does, e.g. with Pacifica Forum. The “safety” rationale fails in the absence of truly proscribed speech, such as true threats (and even then, it would be unclear whether an individual threat would be enough to discipline the entire group). … In Tinker v. Des Moines Independent School District, the Supreme Court determined that, even in high schools, “undifferentiated fear or apprehension of disturbance is not enough to overcome the right to freedom of expression.” (Emphasis added.) Tinker is binding on public colleges like University of Oregon as a minimum requirement—colleges must tolerate much more freedom of speech than must high schools. Thanks to Dane at the Commentator for the link – they have a lot of sensible posts on this, like this, by Evan Patrick Thomas. Nice work Mr. Thomas, whoever you are.